In my previous post, I talked about how angry I was about the way Deep Space Nine ended, but alluded to something beautiful in it as well. Well, here it is, folks. Quite unintentionally, I found another Christ figure in Star Trek. I’ll admit it was somewhat annoying to find this because it would have been so much easier to just hate the end of DS9. Instead, I’m stuck with the cognitive dissonance of, on a very human level, hating that all these great family relationships, romances and friendships are broken up in the series finale and especially that Ben’s new baby needs a Daddy, while still finding a beautiful image of Jesus in the narrative. In fact, it is my very sorrow at Ben Sisko’s departure that makes this image so strong. So, how does Ben Sisko qualify as a Christ figure? First, let’s look at something he shares with our other two Star Trek Christ figures: a dual nature. We discover that Ben’s mother is not the woman who raised him. Instead, his real mother was a woman who has been taken over by one of the Prophets, the gods of Bajor. So, he is of mixed human and superhuman (or human and divine) lineage. He’s part Prophet. This of course reflects (in a limited way) Jesus’ dual nature as human and Divine. Like Jesus, he struggles with his divine calling and his human desires, ultimately choosing to surrender to the will of the Prophets the way Jesus chose to surrender to God, his Father. The gender roles are reversed in Sisko’s parentage, as he has a human father and (for the sake of this metaphor) a divine mother. So it is his mother’s will to which he submits, but the surrender occurs nonetheless. Indeed, as the series progresses, the Prophets begin to appear to Benjamin only as Sarah, his real mother. 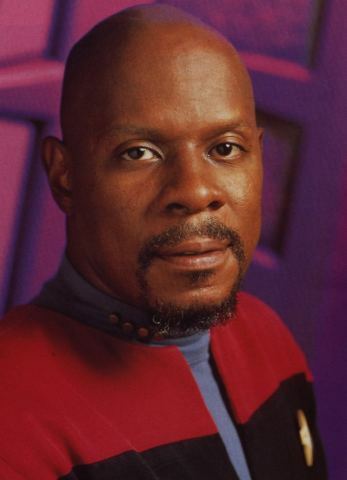 Like Jesus, Sisko has not only human and divine parentage, but an earthly human who raised him alongside his human parent. Ben has a non-Prophet mother, just as Jesus had Joseph, a human father. Sisko’s destiny is one of pain and sacrifice. He is the chosen one, the savior of Bajor and indeed the entire galaxy. Dukat’s description of a universe set aflame clearly indicates that the Pah-wraiths do not intend to stop at destroying Bajor. In the same way, Jesus was sent as a Jewish Messiah, initially appearing to only represent salvation for the Jewish people. Instead, the salvation he brings is universal–for all people. Indeed, the Bajoran people reflect the Jews, a deeply religious people who live under a kind of Theocracy and have been a persecuted, occupied people for many years. Here, Benjamin deviates from Jesus a bit in that he is not Bajoran by birth. But, as the Prophets note, “the Sisko is of Bajor,” indicating that, likely because he is connected to the Prophets, he is in some way Bajoran. In fact, he intends to live out his life on Bajor after the war. In this sense, the Bajorans are ultimately Sisko’s people, even in an ancestral sense. Nonetheless, though he is sent first to them (as Jesus said he was sent to “the lost sheep of Israel”), he was ultimately sent to save all beings in the universe. It is not insignificant that this salvation is not just of lives, of souls, but of planets and stars, just as Jesus was sent to save not just people, but the whole of Creation. Then, just as Jesus struggled with the Sanhedrin and with Rome, Sisko struggles with the corrupt religious and political authorities on Bajor. Winn is his Ciaphas, though she is ultimately instrumental in the completion of his mission. In a certain sense, the real Ciaphas, Pilate and even Judas also helped Jesus complete his mission by conspiring to crucify him. Jesus seeming human enemies were not his true adversary; Satan was. In the same way, Sisko’s real enemies are the Pah-wraiths. The Pah-wraiths are consistently similar to demons and to Satan, first appearing when they “possess” Keiko. In addition to living in the fire caves and appearing as flame themselves (reflecting the fires of Hell), they are also serpentine, snake-like, recalling Lucifer as the serpent of Eden. Ultimately, they possess Dukat, returning him from his Bajoran form to his true Cardassian nature. As Satan hides his true nature by appearing as an angel of light, so Dukat appears as a kind, harmless Bajoran whose name just happens to be Anjohl (pronounced “Ann-jul”). But, in the end, Dukat’s true nature is revealed as that of his reptilian, Cardassian self, again a snake-like image for the personification of the Devil. In the end, Benjamin must sacrifice himself as, by his death, he casts the Devil (Dukat) and all his works (the Kasst Amojin) into a literal lake of fire. It is a picture both of Christ’s victory that was won on the cross and the ultimate judgment that awaits Satan. Then, just as Jesus appeared in the upper room to his disciples (his Church, his Bride) so Benjamin appears to Kassidy (his bride) in a kind of upper room–her mind. This return of sorts does not include (as Spock and Data’s stories do) a literal bodily resurrection, but it is nonetheless a moment where the chosen one who has died to save all returns to his beloved and promises before leaving again that he will return. When? Ben doesn’t know. It’s not linear, he tells Kassidy. It could be in a year or yesterday. In the same way, Jesus said that no one–not even he–knows the day or hour of his return, but only his Father in Heaven. And so, the sorrow I felt at Benjamin’s departure, my ache for him to return to his friends and family, reflects our own desire now for Christ’s return. We stand here, the Bride without her Beloved, longing for him to come back and claim us as his. Remember also that Kassidy is pregnant. Benjamin will, in a sense, continue through her. In the same way, Jesus left the seed of faith in the remnant who followed him and they spawned generations who continue to look for his return. We trust with Jesus, as with Benjamin, that the Divine plan will bring restoration and wholeness to all–that even those of us who can only now long for our savior’s return will be made complete. So that’s it, folks. The Gospel According to Deep Space Nine. It’s a story that ends in both sadness and hope and once again shows us Christ in Star Trek. wow! What a powerful post! While I admire Sisco, how do you account for the fact that he belonged to StarFleet, engaged in war, and even engaged in questionable conduct when persuading the Romulans to fight in the Dominion War? jesus was certainly less concerned with the state and state politics dealing with it only when necessary while Sisco is a StarFleet officer. Although I admire StarFleet, one could argue that the StarFleet brass resembled the Pharacies of Jesus’s day in a sense. (please forgive my spelling at this hour). No offense intended here but there is a fine line between state and religion and they do not work well together. I’m surprised that StarFleet didn’t reassign Sisco outright. I think StarFleet feared religion because humanity has abused God’s Word for its own agenda, and I am referring to all the Worlds’s religions here. Or, did StarFleet reject religion in favor of science? You can have both and apreciate each aspect if you combine the two. I was deeply troubled by a post from Sojourners– of which I’m a fan– that indicated that one nonprofit group lost its funding for food because volunteers asked individuals to pray. I think this is extreme but also agree with the separation of church and state. So, you are asking why I bring this up? It is to say that StarFleet and Deep Space 9, like our world at the moment, practice extreme forms of religion– either failing to acknowledge its potential in healing and growth– or abusing it in favor of false Gods. We have a number of episodes in Star Trek that discuss False Prophets and lets not forget the Final Frontier movie! Ducott abuses Bajoran faith and Win reminds me of the Pharacies. The Bajorans are divided as well (Remember the squabbles among the Ki candidates and The Circle)? Sisco is brilliant–he demonstrates faith in action and acknowledges failure at the same time! Prayer alone or a monistary isn’t enough– faith in action, to me, is a more powerful way to spread Jesus’s love! That isn’t a threat to any government and can’t be challenged! Love for God’s creation can compel us to think about the needs of the many over the needs of the few! It saddens me that StarFleet discredited Sisco’s visions, but I understand this fear as well. Faith outlives skepticism. Faith in God and our potential to glorify him by celebrating diversity brings a smile to my heart! I think Star Trek’s vision of the world is much closer to the Bible– maybe we’ll see this when our Savior returns! What does God have to say about Star Trek! I agree that there are some major deviations between Sisko and Jesus. As a Christ figure, though, he need not accurately represent Christ in every detail–if he did, he’d just be Jesus! Instead, Sisko fulfills some important narrative and character requirements for being a partial picture of Jesus. Spock and Data have their limitations as representations of Christ as well. For me, where the similarities end, the Christ figure status ends too. It’s just a part of who each character is–one way to understand them. It’s also amazing to me that these things exist, especially given the fact that none of these characters was ever (to my knowledge) intended to reflect Jesus. And you’re right. Our world certainly lacks a balanced understanding of faith and religion. But we’re getting there, I hope! I also agree with you about the issue of church and state. A church should not govern or dictate what a government does; nor should a government become a religion or dictate what religion does. Our faith must inform our political action, but in carefully considered, realistic ways that look out for the good of all people–whether or not they share our faith or values. That idea can easily be represented by Star Trek in many ways. It’s that beneficial involvement in our world and love for others inside or outside the body of Christ that I would most like to see our Christian culture (re)learn from Star Trek. Thank you for your thoughtful and informative commentary! I agree with you on all points! I appreciate Star Trek even more now that we are sharing ideas and I thank you for your dedication to this wonderful project!